Reading and understanding the points made in the paragraphs below regarding Copyrights is a strict condition of use of the Memorabilia UK Limited website. Memorabilia UK Limited fully recognises and respects the rights of copyright owners within photography. 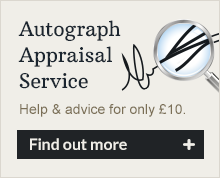 We are in the business of selling celebrity autographs (not photographs) and much of the website is devoted to customers for historical pleasure, reference and educational purposes. We do not seek to financially gain by the use of and do not ever knowingly or intentionally use copyrighted images on our website without (whenever possible) firstly obtaining the permission of the owners. All images used within the overall design of the website itself have been purchased from iStock. All celebrity images used within our autograph display presentations are supplied to our customers free of charge, are not permanently fixed and can be easily removed by ourselves (or the client) in less than 30 seconds if required. All these images have been purchased from third-party photo dealers and sellers easily found at various National Memorabilia Fairs / Ebay / Press-Agencies / Celebrity Agents and auctions. None have ever originated, been printed or reproduced by ourselves. To the best of our knowledge all the celebrity images we have purchased have been supplied to us in good faith and are copyright / royalty free. We are simply a small business very consciously trying to operate responsibly within the correct boundaries / rules, so if you are an original owner believing any image used on the Memorabilia UK Limited website is in breach of copyright, please do contact me and it will out of respect be removed immediately. Memorabilia UK Limited recognises and fully respects the rights of copyright within photography. Where photographs have been obtained , given or purchased by us that do carry copyright detail we will ensure that this information remains in place on the photographs themselves. * All photographs supplied within our display mounts are given to our customers free of charge WITHOUT ANY CLAIM to or sale of the images copyright included. Memorabilia UK Limited are not responsible for any subsequent usage by any future owner as this may not be permitted without their first seeking the permission of the original copyright owner. We would strongly advise any visual media and TV companies looking to show our autographed display mounts within any live programming to do their own copyright research. * Any usage / display of copyrighted images or logos within our website is "completely accidental and wholly unintentional". All reasonable attempts have been made to research and "try to ensure" that copyrights have not been broken. No images on the website show any watermarking or coding and all have been bought in this form. All have been purchased from sellers as quality prints and have also not ever been altered, printed or reproduced by ourselves. * All images utilised on the Memorabilia UK Limited website have been purchased from registered third parties and are not reproduced. * All products sold via the Memorabilia UK Limited website are for our customers personal use only. As specialist autograph dealers Memorabilia UK Limited are NOT in the business of selling photographs. All the images / photographs contained within these display mounts are given to the autograph buyer / customer completely free of charge, are not permanently fixed and can be easily removed (within 30 seconds) by ourselves or the client if required. Memorabilia UK Limited receive no actual financial benefit or remuneration from their supply. * Memorabilia UK Limited purposely avoids the use of photographs and images of “current celebrities” wherever possible , in order to preserve the rights of the individual concerned. Current celebrities and photographers will in most cases be rightly protected by copyright and image rights and we would not ever knowingly wish to court the disapproval of any of these persons. * Memorabilia UK Limited does its best to research and seek the potential owners of copyright on all photographs used on our website but this is often extremely difficult and time consuming. We would never knowingly breach any possible rights of ownership to a celebrity or their photographer. We welcome the contact of any individual concerned in relation to these difficult issues. “PLEASE PLEASE” first contact us at Memorabilia UK if you think we are breaching any copyrights and we will gladly unconditionally immediately remove any offending image from our website. Memorabilia UK Limited accept no liability for any potential copyright infringement in respect of any third parties personally chosen use of The YouTube video links that maybe found on our website. All the films / images and sounds that it is possible to view from our website are simply embedded links to the main YouTube website. The images and content of these are viewed at the sole discretion of the individual , unknown to ourselves. The images and sounds on the videos are purely there for the additional pleasure of our website visitors and are neither owned by us nor have we ever been responsible for the original placing of them for viewing via the YouTube website itself. The first frame image shown on all YouTube videos found on our website has to be activated to play; it purposely will not start automatically , so becomes simply personal choice for any user. As previously stated , all video-clips images and sounds embedded onto the Memorabilia UK Limited website are universally available links to YouTube and as such Memorabilia UK Limited should not be responsible for their usage and will accept no liability whatsoever for their content, or any potential copyright infringements that may arise from their use now or in the future. The responsibility lies entirely with YouTube and whosoever the third party was that originally created and uploaded these images onto the YouTube website. Before creating any potential links , Memorabilia UK Limited carefully check the description on every YouTube film in order to ensure they are not registered to any company or individual , in order to respect and protect full personal rights of ownership. We would always assume that should any issue ever be found, that person would have first contacted YouTube direct to have the item concerned removed at source. However if the use of any sounds or images on our website causes offence or unbeknown to Memorabilia UK Limited breaches any ownership or possible copyrights. "PLEASE PLEASE" first contact us direct at Memorabilia UK and it will be unconditionally instantly removed from our website. Permission for any copyright scanning robot to access the Memorabilia UK Limited website is most explicitly denied. This includes all robots supposedly scanning any website content for the purpose of law enforcement criminal or civil. We regard this as illegal hacking, infringement of our own copyright, an invasion of privacy and theft, due to their utilising / sucking up large amounts of band-width that is paid by us. We will seek damages of 5000UK pounds per violation from any company or individual making financial demands or issuing threats of legal action against ourselves as a result of their involvement or usage of scanning robots.